A weekly newspaper has celebrated its 160th anniversary with a 12-page supplement looking back over its history. The Western Telegraph, based in Haverfordwest, was first published in 1854 and it produced the supplement to kick-off its birthday celebrations this year. In the supplement, the Newsquest title updated readers on important technological developments since its 150th anniversary, when a pull-out was also produced, as well as reviewing the biggest stories of the past decade. 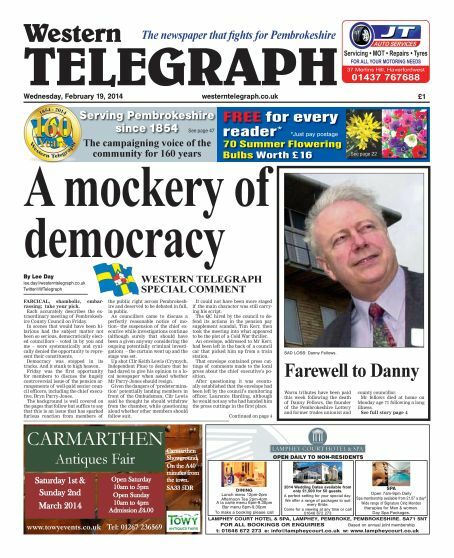 The 136-page anniversary edition also featured a special comment on the front page, pictured below, about scenes at Pembrokeshire County Council when councillors were prevented from voting about the chief executive’s future because they had spoken to the local press. HTFP reported last week that a vote could not go ahead over whether chief executive Bryn Parry-Jones should be suspended over his controversial pension arrangements, because councillors had given their views to the Telegraph and the Pembrokeshire Herald ahead of a meeting. The Telegraph has reported since early 2012 on changes to the pension arrangements, which allow top earners at the council to receive cash payments in lieu of employers pension contributions. The front-page comment piece by news editor Lee Day called the meeting “a mockery of democracy” and he said it had received “excellent feedback” from readers. Editor Holly Robinson said: “Here at the Western Telegraph, more than any other newspaper I have worked on, our teams are largely made up of people who have been raised locally and who choose to make a difference to the communities where they have grown up. The Telegraph’s supplement included stories about developments such as its website, social media and iPad app. It also reported on major stories from the last 10 years, including the conviction in 2011 of John William Cooper for two double murders that had haunted Pembrokeshire since the 1980s and the explosion at the former Chevron oil refinery at Pembroke that killed four people, also in 2011. It’s a shame the Western Telegraph is such a weak newspaper. HTFP reports on that ONE week where it went to town on the shambolic council meeting. It was good coverage by anybody’s standards, but what HTFP might not have been made aware of by Lee Day is that in the very next week’s edition the Western Telegraph gave over a huge section for the council leader to have a ‘right of reply’ to the following week’s coverage, in which he didn’t feature as the main subject in any case. Within his ‘right of reply,’ the newspaper’s coverage on the scandalous council meeting (which was all true, robust journalism) was rubbished by the leader, Cllr Jamie Adams. The Western Telegraph is an absolute joke, and is not to be taken too seriously. 160 years old and still has no backbone. Check out the comments it received. The Pembrokeshire public knows what’s going on. We aren’t fools. My first comment should have said the *previous* week’s coverage, and not the *following* week’s coverage.